A central hut for the Kaitoke to Holdsworth trip (3 days). 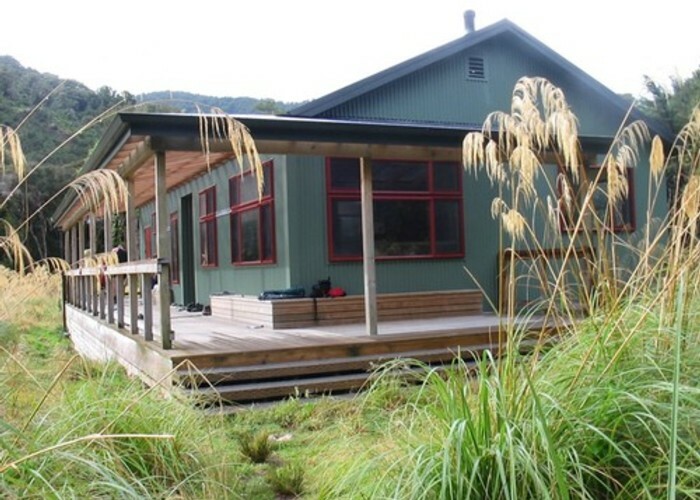 It was sited under trees at the north-west corner of Totara Flats (largest flat in Tararuas at 2 km by 0.5 km) but was replaced since it was built on unstable gravel. It is now located a few minutes to the north (near the old hut site). It takes about 26 in two separate bunk rooms. The living area has 3 tables, a big wood burner, plus a separate bench area for preparing your food. There is a covered lean-to with a couple of sinks to do your washing up and ablutions. Have a look at Sayer's Hut over the river. DOC has removed gas cookers, bring your own cooking equipment. 4 hours from Holdsworth Lodge, 5 hours from Tutuwai Hut. Added 8 December 2005 by ianfiskianfisk. 1 revision 24 February 2015 by nzjoelnzjoel. 326 views in the past year (27 per month).